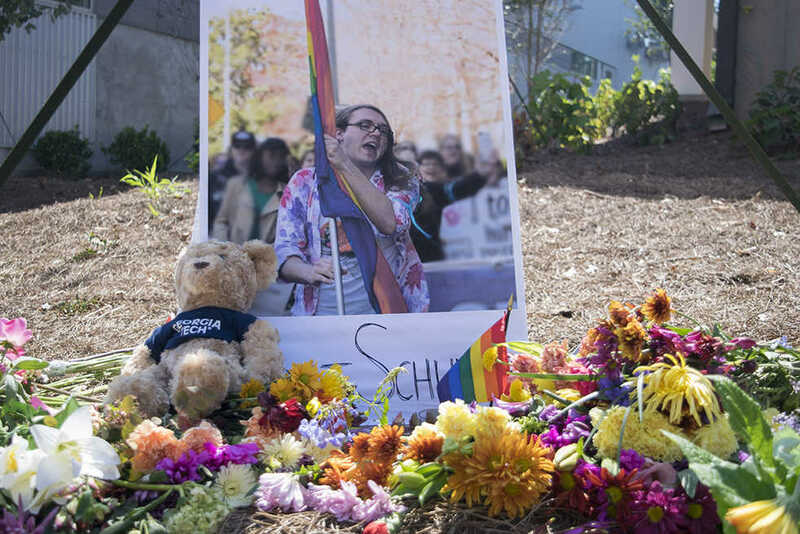 One year after the fatal campus police shooting of Tech student and LGBTQIA+ community leader Scout Schultz on Sept. 16, 2017, two separate gatherings were held in memory of Schultz’s life. The first — a memorial service co-hosted by the LGBTQIA Resource Center and Pride Alliance and held in Smithgall auditorium on Friday, Sept. 14 — had students, faculty and family and friends of Schultz gather to express recollections of Schultz. The other — an open vigil on Tuesday, Sept. 18, beginning on 8th Street and morphing into a quiet march to the Campanile — had students in the LGBTQIA+ community share memories of Schultz, as well as a combined conviction to continue to advocate for needs they feel Tech administration continues to ignore. During Friday’s memorial service, those closest to Schultz were allowed to share their thoughts. Neither audio and video recording were permitted at the memorial, partly to deter the level of media attention that affected similar memorial services last year. Each speaker took a different approach when speaking of Schultz. Some directly spoke of their ability as a student and their role on campus, while others took to lightening the mood by interjecting humor into their message to the audience. Every speaker emphasized one trait of Schultz’s character — their activism. During their time at Tech, in addition to becoming president of Pride Alliance, Schultz led marches to support Muslim students at Tech and started a fundraiser to donate money to transgender homeless youth. Schultz also had mobilized peers to combat white supremacy and worked in events to help prevent sexual violence, speakers shared. Speakers also mentioned their first experiences meeting Schultz. For some, it was during their first days on campus when they happened across the Pride Alliance booth at FASET. Others first encountered Schultz inside Tech administrative offices, engaged in a conversation with President G.P. ‘Bud’ Peterson. Multiple speakers emphasized that Schultz loved to talk about a range of topics, whether it be campus regulations or local politics. Faculty described Schultz as an exceptional student both inside and outside of the classroom. One professor praised Schultz’s inquisitive nature during classroom discussions, as well as their activism throughout campus. Along with having a near-perfect GPA, Schultz was known to regularly attend office hours and take the initiative to learn extra material—a true display of curiosity. Following the Friday memorial service, individual counseling sessions were made available to help those who continue to struggle with the events of last year or simply want someone with whom they can to talk. A few hours after the memorial service ended, at 3:31 p.m., a Facebook event titled “1 Year Later — We Remember Scout Schultz” was posted anonymously online, inviting people to attend an “anniversary of the events that transpired at the vigil meant to honor Scout’s memory,” according to the public event description. Last year, on Sept. 18, a candle-light vigil around the Campanile was followed by a protest in which a violence subset set a Georgia Tech Police Department (GTPD) cruiser on fire, and multiple demonstrators were arrested by police. Over the weekend, through social media, Tech students became aware of plans for the anniversary vigil, which would meet at 8th Street at the very spot where Schultz was shot and killed by GTPD police officer Tyler Beck. Multiple students, many from the LGBTQIA+ community at Tech, chose to attend. Huddled in front of the south doors of Eighth Street South dormitory, a group composed of students and other demonstrators held battery-powered candles and spoke to each other through an electric loudspeaker. Schultz, Kaffezakis said, had worked to fight to resolve such issues on behalf of vulnerable members of the campus community. The peaceful protest was closely watched by a wary assortment of Georgia Tech Police Department (GTPD), Georgia State, and Atlanta Police Department officers. Perched on the third floor balcony of West Village, a pair of neon-vested GTPD patrol officers observed from above. Julia Grey, third year BME aimed her speaker at the West Village balcony, inviting vigil attendees to wave to the GTPD officers. Attendees applauded as the officers retreated into West Village. After sharing their words with one another, a group of demonstrators marched down to Hemphill and stood outside of GTPD headquarters. A second group, composed almost entirely of students, also marched, but kept their distance from the police headquarters. After police cruisers surrounded Hemphill, both groups continued to march south to the Campanile, where the demonstration dissolved peacefully.